Easy!Appointments v1.3.2 is available for download! 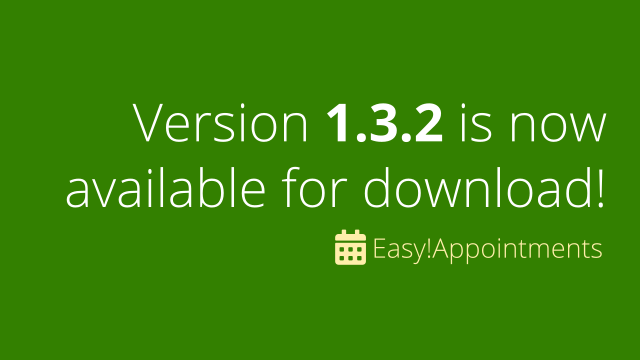 Easy!Appointments v1.3.2 is now available for download! Make your installations GDPR-ready! #480: Make the app GDPR - new EU privacy regulations compliant. #485: Make REST API search check with “q” parameter case insensitive. #489: REST API response headers must use the Content-Type application/json value. #500: Performance optimization in backend calendar page, after the user clicks the insert appointment button. #510: Providers should not be able to create appointments for other providers in the backend calendar page. #512: Only show appointments of the currently logged in provider.